As kids growing up in South Mumbai, we often went to Crawford Market and environs for most of our shopping. Abdul Rehman St for stationery, Lohar Chawl for all our electrical stuff, Paidonii, Zaveri Bazar and wherever. To this day, the wide variety of things you can buy there amazes me. I saw my favorite &apos;Nutella,&apos; much cheaper in Mumbai than here in Boston. 😦 My cousin and I walked till we dropped; then rested at > Badshah Cold Drinks. This 100-year old institution has quenched millions of parched throats. It has the widest selection of fruit juices, milkshakes and icecreams. 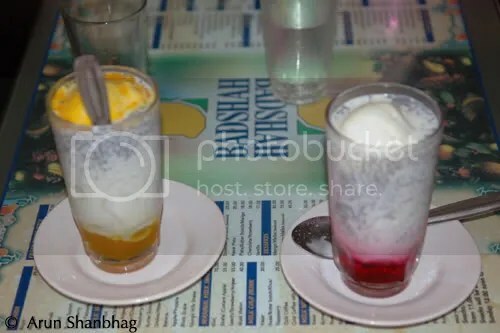 I spend a few minutes browsing the entire menu and as usual, end up ordering what I always order – Royal Falooda. Rose Syrup, vermicelli from maize flour, milk, sabjah (black seeds) and topped with vanilla icecream! Heavenly! My cousin brother tried the Mango Falooda! The bill was less than Rs 90 (< 2 USD). 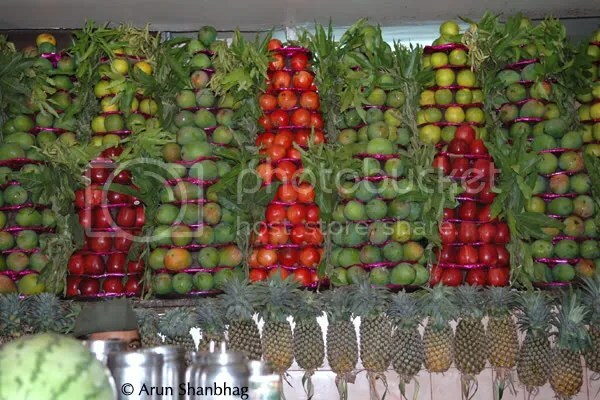 Fruits arrayed behind the counter. Can you spot the peeping worker?